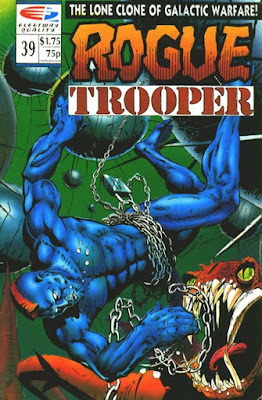 I've read the entire Rogue Trooper series in the omnibus editions but it was fun to read this old comic and see the blue guy actually blue. 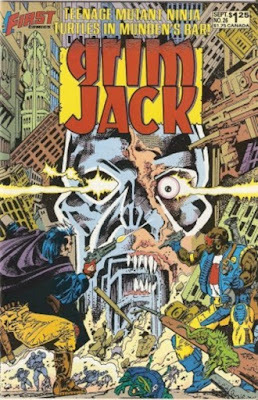 the comic begins with a short story which is the beginning of a new arc where Rogue is on a mission to seek out and destroy new moral armies (basically cults). Then the rest of the book is comprised of two short "Ace Trucking Co: Any Space Any Time" which I've never heard of before. It basically seems to be a space comedy but was hard to get into because there is a lot of made-up space lingo. Probably not the best place to start reading this series. So some villain is back, not sure if he escaped or what, but he is an entity who strips the skin off his victims and wears the skin as a body clone. Kalibos is his name and Grim Jack and his friends (team?) work on discovering his new lair. Certainly readable for me who hadn't a clue what was going on. Then comes the piece de resistance with a TMNT short at the back. Raphael and Michaelangelo star in this one about underage adventures and brawls in a bar. So not your children's Turtles! And of note, all the TMNT wear a read band so you can't tell them apart.